The Heritage Ella, may sound like one of the many new properties springing up in the once sleepy hamlet of Ella, but it has a pioneering legacy. As the Ella Rest House it was the only place for travellers to stay in Ella while in transit to the east or south coasts. In 2000 it was transformed into a more upmarket property and given the name Grand Ella Motel, and helped to stimulate the awakening of Ella as a convenient upcountry retreat. To meet the demand for accommodation through the increase in the number of visitors, hillside guest houses opened to cater to backpacking travellers. However, none can match the view, the location, the service and the sheer splendour of what is to become The Heritage, Ella. Part of the Galle Face Hotel Group, through its Ceylon Hotels Corporation properties, the Grand Ella Motel is to undergo a striking transformation. This is part of the policy introduced by the chairman of the Galle Face Hotel Group, Sanjeev Gardiner, to make the group's rural properties attractive to domestic and foreign tourists. The project to implement the improvement in standards and infrastructure has been entrusted to a team headed by the veteran hotelier, the group's Senior Vice President, Chandra Mohotti, and Vice President Chethiya Perera, who is in charge of operations. The hotel is poised at the edge of a view that seems to go on forever. 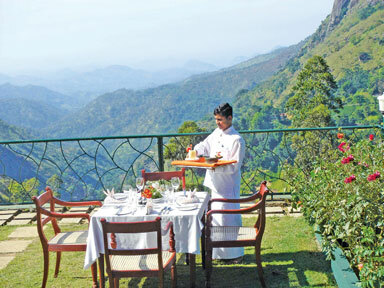 It is 1,041m above sea level and to have breakfast on the lawn overlooking Ella Gap is to enjoy a culinary experience that inspires memories of the scenery as well as of the cuisine. To the left of the Gap view is a mountain known as Small Adam's Peak, while to the right is Rawana Kandha (Ella Rock). The hills stretching to the far horizon include the Maha Galbokka Rock, the Hambegamuwa Mountain Range, the Kotawehara Gala Mountain Range, the Bubula Kandha and Bambaragama Kandha Mountain Ranges. Beyond the mountains the southern seacoast twinkles in the distance. There are only 10 rooms at the hotel offering the privilege of such an extraordinary view. Landscaping of the gardens is enhancing the view even more, with sunshades for blissful relaxation on the lawns. All the rooms have balconies or terraces, where meals can be served. Two rooms share a large terrace overlooking the breathtaking scenery. The rooms are thoughtfully furnished, with blissfully comfortable beds, and streamlined bathrooms introduced by renovation. Service to the rooms is swift as none of them are far from the restaurant or the central, open-sided reception pavilion that adjoins the forecourt where visitors' cars park. Non-residents are welcome for meals and the hotel has won a reputation for its uniquely Sri Lankan cuisine. All spices are ground in the hotel's kitchen, not pre-prepared in catering packs. While buffet meals are available when business is brisk, guests can request whatever they require and have it cooked. Juice is freshly squeezed and presented with fruit garnishes. There are even special non-alcoholic cocktails for children. Wines are first class and, like the cocktails and spirits, sustaining the value-for-money reputation The Heritage, Ella, had as a rest house. In spite of its good food, good prices, stunning view and ideal location, the hotel would not be worth a night's stay if it weren't for the obliging staff. Everyone works together to make guests welcome, happily pausing in their duties to explain the attractions of the area. This makes the hotel a delightful base for several days, not just overnight, since there is so much to do in the area. As well as sightseeing, trekking the hills and checking waterfalls, day trips are possible to Badulla, Bandarawela and Haputale, where Lipton's Seat and the Dambatenne Tea Factory (the longest in Sri Lanka) can be visited. Ella and legend are intertwined. Sita, the beautiful wife of Rama, is said to have been hidden in the caves at Ella by Ravana, King of Lanka, according to Ramayana, the great Indian epic dating to more than 1,000 years before Christ. Ella is 240km from Colombo Fort and a perfect transit stop on the way to Arugam Bay on the east coast, or down through Wellawaya to Kataragama, Yala and Tissamaharama in the south. To stay at The Heritage Ella, is to experience the charm of rural hospitality, as well as possibly the best and most convenient scenic location in Sri Lanka.